On Feb. 3, the Golden Rams had a spectacular meet at Towson University. It was predicted to be an “easy Towson win,” as stated by the Towson announcers, but throughout the meet they had a major change of heart. The Golden Rams “were a very impressive team, and really put up a good competition.” The final score of the meet was Towson 193.525 to West Chester’s 192.550. The Rams started off very strong on bars with Miranda and Meakim opening with a 9.525 and a 9.625. Duke and Marshall also had very impressive 9.650 scores with Wojewoda leading the event with a 9.675 taking third. The team score was a 48.125. Onto the vault, the Golden Rams looked super strong. Kissinger opened up the event scoring a 9.575. she was followed by Mathis’s strong 9.575 as well as Duke’s impressive 9.675 taking third on the event. Meakim and Johnson closed the event with a 9.650 and a 9.625. Their total vault score was a 48.100. Heading over the Golden Rams floor performance, they looked amazing and had tons of fun. Nodarse started off the event with a strong 9.675 followed by Hageman’s 9.575. Keeping up the momentum, Boyd had an impressive 9.625 followed by Johnson’s 9.575. Fanara had a strong 9.750 score and Meakim closed in a three way tie for first place with a 9.800. The floor score was a 48.425. Onto their last event, the Golden Rams fought hard. Judging was tough, but the gymnasts worked hard. Wojewoda led off the event with a solid 9.575 followed by Miranda’s 9.525. Hageman tied for second with a 9.650 and Nodarse had a strong 9.525. Boyd finished the event with a strong 9.625. They finished beam with a 47.900. On Feb. 9, the Golden Rams had a good meet at SUNY Cortland. They took the win at the tri meet against Ursinus and SUNY Cortland scoring a 192.625. The Golden Rams had some impressive scores. They scored their season high 48.7 on beam, 48.825 on floor, and 48.175 on vault. They struggled a bit on the uneven bars, but the consistency and high scores on the other events held them up. Some highlights include Meakim taking first on the vault followed by Johnson in second and Mathis in third. On bars, Marshall took first place and Meakim took second place. Nodarse tied for first on the beam followed by Boyd placing third. On the floor exercise Fanara took first place followed by Johnson, Kissinger, and Nodarse all taking third place. On Feb. 15, the Golden Rams were home competing for an amazing cause. The Golden Rams hosted a suicide prevention awareness meet, and it was an amazing night all around. Fans came out in their gold, and it was the biggest crowd WCU Gymnastics has ever seen. The Golden Rams hosted Division I William and Mary and Rhode Island College. The Golden Rams ended up on top and won the tri meet. This was a huge win for West Chester because it was over a very good Division I team. The Golden Rams scored a 192.675 followed by William and Mary’s 192.525 and Rhode Island College’s 182.825. The Golden Rams went in Olympic order on Friday night being that it was a home meet and started on the vault. Duke tied for third place on the event with a 9.65. Meakim and Johnson were a little farther down the line both scoring a 9.55. Other strong scores included Kissinger’s 9.500 and Mathis’s 9.475. The Golden Rams scored a 47.725 on the event. Moving onto the bars, the Golden Rams had one of their highest scores on the event. Miranda led off the event with her career high 9.700 tying teammate Marshall for third place on the event. Meakim had a solid 9.525 followed by Onderko’s impressive 9.675. Wojewoda won the event scoring her career high 9.850. WCU finished bars with a 48.450. Moving onto the balance beam, Wojewoda and Miranda had solid routines scoring a 9.650 and a 9.625. Nodarse had a clean 9.575 routine, and anchor Boyd placed third on the beam with a 9.750. The Golden Rams had to count a fall on this event, but they did not let that stop them. The floor exercise was the highlight of the meet with an impressive 48.875 team score for the event. Nodarse had a clean 9.725 routine followed by Kissinger’s career high 9.800. Boyd had a solid 9.650 routine. Fanara and Meakim tied for first place on the event scoring a 9.850. Just when the Golden Rams thought they were finished with that meet, they were challenged with a double meet weekend. 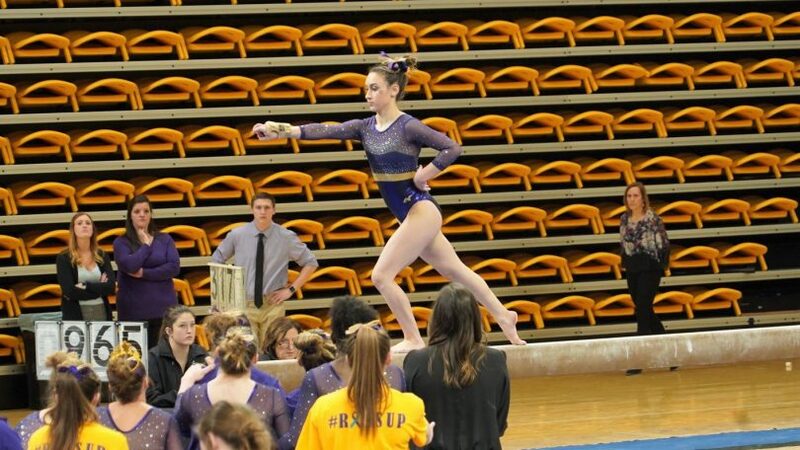 On Feb. 17, the WCU Gymnastics team took on Ursinus College for their second meet in the same weekend. The Golden Rams finished on top of the meet with a 191.725 over Ursinus’s 182.8. The Golden Rams started on the uneven bars for the meet. The Golden Rams took the top four spots on the bars. Marshall took first place with a 9.700. Duke was closely behind in second scoring a 9.675. Miranda took a third place finish with a 9.625, and Onderko took fourth with a 9.550. The team scored a 47.575 on the event. Moving onto vault, Johnson took first place on the event with a 9.625, and Meakim followed her with a 9.600 for second place. Duke had a strong 9.475 placing third as well as Mathis’s strong 9.450 placing fourth. The team scored a 47.275 on vault. Onto the floor, the Golden Rams put on a real fight. Kissinger and Meakim took first place on the event with a 9.700. Fanara placed second with a 9.675, and Boyd took third with a 9.600. Hageman and Johnson also had solid 9.575 scores on the event. The Golden Rams scored a 48.25 on the floor. Finishing up the meet, the Golden Rams had their best event on the balance beam scoring a 48.625. Nodarse had her career high 9.875 tying the school record and placing first on the event. She is hoping to break this record soon. Boyd came in second scoring a 9.825, and Miranda came in third scoring a solid 9.7. Hageman and Fanara also had nice routines scoring a 9.675 and a 9.550. The Golden Rams will be back in action on Friday, March 8 at the McGonigle Hall in Philadelphia. They will be competing against Temple University and Maryland University. Stay tuned for my gymnastics updates!